You don’t become America’s longest-lasting line of pickups without delivering consistently outstanding performance, and the 2017 Ram 1500 certainly lives up to that ideal and then some. With three available powertrains covering diesel, V6, and V8 capability, plus the ability to tow up to a herculean 10,640 lbs., the 2017 Ram 1500 will bare nearly any burden and remain authoritative under all conditions. Your 2017 Ram 1500 can present power the way you want it, with three available engines from which to choose. 3.6L Pentastar V6: The latest Ram 1500 comes as standard with a V6 powerhouse that has landed on Ward’s 10 Best Engines List an incredible three times. Featuring Variable Valve Timing and a sophisticated Thermal Management System, it delivers 305 hp and 269 lb-ft of torque, all while achieving up to 17 mpg in the city and 25 mpg on the highway. 5.7L HEMI V8: The legendary HEMI V8 comes with MDS technology for enhanced power and efficiency. Expect up to 395 hp and 410 lb-ft of torque on tap, even while achieving up to 15 mpg in the city and 22 mpg on the highway. 3.0L EcoDiesel V6: This is the only available diesel engine in the half-ton pickup class, boasting a Best-in-Class 21 mpg in the city and 29 mpg on the highway to deliver a work-friendly driving range of up to 754 highway miles. All that, and it still harnesses up to 240 hp and 420 lb-ft of torque. Regardless of your chosen engine, a state of the art TorqueFlite 8 eight-speed automatic transmission will come as standard, with thermal control optimizing fluid temperatures and a dash-mounted Rotary E-shift fitted for effortless shifting. Ride with peerless control and comfort thanks to standard five-link coil spring rear suspension, which employs proprietary spring technology to improve performance without sacrificing heavy-duty towing capability. For automatic load leveling and an adjustable ride height, opt for available Class-Exclusive Active-Level Four-Corner Air Suspension. 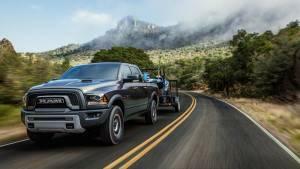 Of course, the 2017 Ram 1500 truly shines when it comes to towing. Each model comes as standard with a 7-pin wiring harness and Class IV receiver hitch. Overall, you’ll enjoy the capability necessary to tow up to 10,640 lbs. and carry a maximum payload of up to 1,900 lbs. Ram also provide the necessary safety and control devices to ensure perfect peace of mind while hauling heavy. Hill Start Assist: Detects when your Ram 1500 is on an incline, then maintains pressure as you move from brake to accelerator to prevent rolling backwards. Trailer Sway Control: Applies braking pressure to individual wheels and/or reduces engine power to eliminate and detected trailer sway. With Best-in-Class efficiency, top-tier towing power, and a string of sophisticated performance features, the 2017 Ram 1500 leads the way with effortless ease. 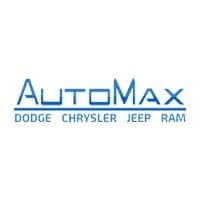 To find out more or arrange a test drive, don’t hesitate to contact one of the team here at Automax DCJR today.